Thanks to Harry Potter, Twilight, and The Hunger Games, young adult fiction is more popular than it’s been in quite some time. To lure some of these teen readers into the classics, publishers are re-designing the covers of classic books like Jane Eyre and Wuthering Heights. According to this article by The New York Times, it’s a mindfreak that seems to be working. The new covers are brighter, handwritten, and more youthful. Some are even directly inspired by the Twilight series, with a black background and single red rose. Many publishers are doing it, and most can since many of the novels are in the public domain — meaning anyone and everyone has free access to them. According to the article, a number of businesses are selling classic novels now more than ever. It’s a plus for bookstores and even teachers who are happy to see young people reading older books. But of course, there are some bookstores that aren’t seeing much of a change in sales — even teens who prefer the originals. “If kids want to read ‘Emma,’ they want to buy it in the adult section, not the teen section,” [Elaine Petrocelli, who owns the bookstore Book Passage] said. 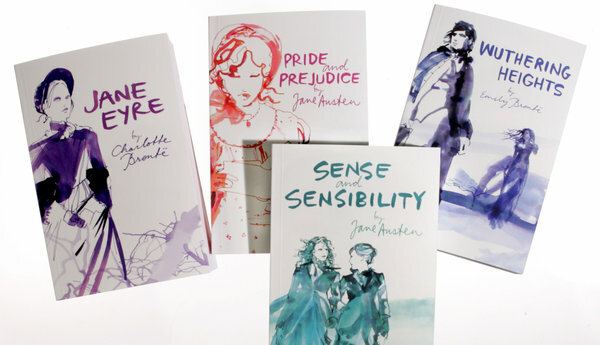 “Kids don’t want to feel like they’re being manipulated.” […] For classics like that and “Pride and Prejudice,” [15-year-old Tess Jagger-Wells] said she preferred her hardcover editions with their flowery covers to the more modern versions. Personally, I prefer the old-fashioned covers because I think that’s part of what makes a classic classic. But I’m also past the YA fiction age. What do you guys think?